Read my reviews of issue #1 here and issue #2 here! 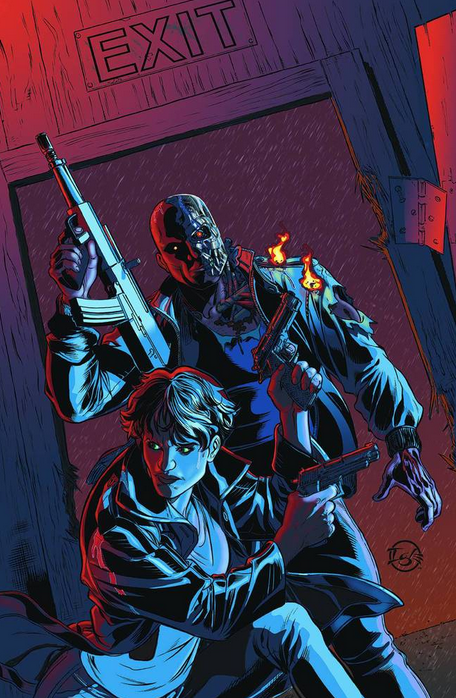 Terminator: Enemy of My Enemy #3 has our heroines in dire straits. The art has improved in this issue, with more consistent and detailed faces. Elise is currently under questioning, and Farrow (now in disguise) needs to get her out of there. The first scene is a bit confusing as to what’s going on, because what we see is occurring in a different place from the dialogue, but overall the plot is much more comprehensible than it was at the beginning of the series. Farrow and the T-800 have an awesome showdown, and there’s a lot of cool car chase artwork. I still think it’s weird that the T-800 doesn’t look like Arnold Schwarzenegger at all. This issue has a lot of comic-book style cursing (#$%^&! ), which I found interesting because the movies are rated R, but the comics can’t have swearing. Being a fairly recent regular comic reader, I’m not sure if this is a limitation of certain comics or what. The ending of the issue has the best cliffhanger yet, and I’m looking forward to issue #4! Get it from Dark Horse Comics or your local comic book shop for $3.99 on May 14, 2014.